What is driving all the people out of the village of Darkhyde ? Why does Digger Pete warn against a strange creature haunting the moors ? First read the gripping tale, then complete the puzzle - this will need some sleuthing as there is no picture reference. 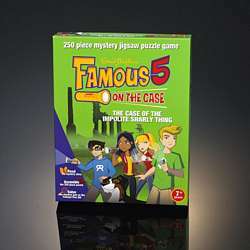 Then solve the mystery, the clues are in the puzzle! The answer can be seen by holding up the solution page to a mirror.